The body does not waste valuable resources, and insulin is largely responsible for this frugality. Insulin is a hormone that actively conserves and stores energy-rich foods when they are taken in excess: excess carbohydrates are stored in the liver and muscle as glycogen, fat is deposited in adipose tissue, and amino acids are converted to proteins. While our understanding of insulin’s effects on the body’s chemistry is of relatively recent vintage, descriptions of diabetes, a metabolic disease resulting from insulin resistance or deficiency, appear in ancient Egyptian and Greek manuscripts. Our modern understanding of diabetes began in 1869 when Paul Langerhans, a medical student, discovered previously unrecognized cells in the pancreas, which were later designated the islets of Langerhans. Thirty years later, Joseph von Mering and Oskar Minkowski sought to determine the biological function of the pancreas. After removing this organ from a dog, it exhibited all the signs and symptoms of diabetes, including the telltale presence of sugar in the urine. In 1921, Canadian surgeon Frederick Banting persuaded John J. R. MacLeod, a physiology professor at the University of Toronto, to allow him to use his laboratory and ten dogs while MacLeod was vacationing. Banting recruited Charles Best, who was waiting to enter medical school, to assist him. They repeated von Mering and Minkowski’s experiment and reversed the diabetic symptoms by injecting the dog with a pancreatic extract taken from a healthy dog. In January 1922, a fourteen-year-old diabetic, Leonard Thompson, was the first patient given a pancreatic extract and was successfully treated. Life-saving insulin was discovered! In 1923, the Nobel Prize was awarded to Banting and (an undeserving) MacLeod. Banting shared his prize money with Best, as did MacLeod with Collip, who purified insulin from the pancreatic extract. That same year, Eli Lilly began the commercial distribution of insulin. Prior to the discovery of insulin, a newly diagnosed type 1 diabetic had a life expectancy measured in months or less. Now there is little difference in longevity between well-controlled diabetics and nondiabetics. SEE ALSO: The Liver and Glucose Metabolism (1856), Secretin: The First Hormone (1902), Amino Acid Sequence of Insulin (1952). 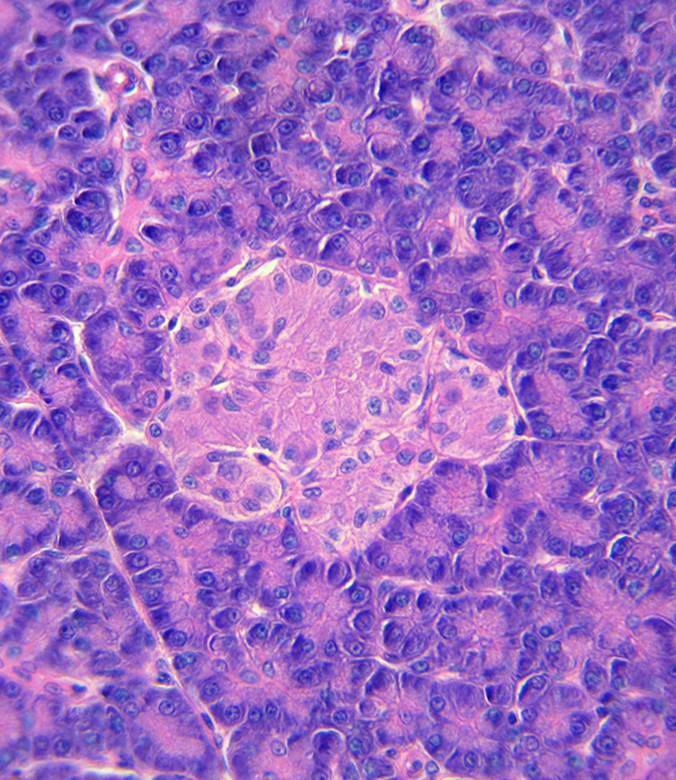 The islets of Langerhans (shown here in a high-power magnification), located in the pancreas, are responsible for the production of insulin.